This is a complete list - for ease of reference, I have put LNER Catering and LNER NPCS in separate sections as well. - MJT kit built and compared with Comet and Kirk. Best account I have written on how to build MJT etched sides. The techniques shown here are referred to in subsequent articles. A review of the new range with pictures of etchings, three pairs of made-up and painted sides in LNER and BR liveries, and a D&S 52'6 GNR Saloon completed with MJT roof, ends and underframe. 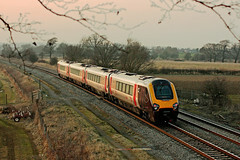 - Brief history and prototype photo of the flat-sided matchboard design and service into BR days in secondary services. - Construction of the D&S kit with some additions and tweaks to make construction easier. - Another one-page piece, about the Gresley 66'6" SLF (1st Sleeping car) to D.157 which was fitted with a shower. - Based on 61'6" Kirk sides and MJT parts "stretched" with various additions by scratch. The interior was fitted with beds, pillows, sheets and blankets: a most enjoyable project, this! - 50' design of 1903, brief history of vehicle and use in service with protoype photo. - A reworking of the Perseverance kit. - The constructional illustrations were not used; they are now under "Modelling", showing the CL and BT, along with some extra prototype illustrations. An illustrated letter on the nature of LNER brown. (There should have been an article on this subject)! - Gresley 51'1 1/2" BT(4) to D.294. - Thompson 52'4" BC(2,6) to D.360. - Historical and service intro. Models built in similar fashion around a Cu-clad base and MJT and ABS parts, with corrected sides from Kemilway (an old kit) and Comet. Both finished in BR crimson. 1pp, 3 illus. (one prototype). Nov 1999. - Historical intro with service notes and photographs. - Construction of two MJT models, in LNER teak and BR carmine & cream. 4pp, 9 illus. (including two prototype). Feb 2000. - Ex-GCR 60' matchboard brake composite of 1911. Some historical notes and photographs. - Falcon Brass kit much reworked or, more accurately, scratch-built with reworked side etchings. - Historical: an overview of workings on former LNER lines. First in a series of 12 articles whose titles kept drifting! - Thompson 52'4" steel-panelled CL, BC and T.
- Built using corrected Comet sides married to a Cu-class base, scratch built ends, MJT roof and u/f fittings, ABS bogies. A first presentation of how to build a rock-solid base for a model with etched brass sides. Much used in subsequent models. - Historical: Gresley articulated twins and the "steel quintuple sets" on LNER and former GNR and GCR lines. - Historical and modelling, workings on the GN Section, LNER. - Gresley 51'1 1/2" twin BT-CL. - Based on the Kirk kit with scratch built ends, other parts MJT and ABS. A first presentation of a base built around .060" Plastikard and Evergreen solebars. - Historical and modelling. Workings on the GN Section. - LNER former GNR Gresley 58'1 1/2" BC. - A reworking of the D&S kit, in particlar the base using the technique described in the above article. This was an early and problematic floor-pan design by Dan Pinnock which he dropped: the modelling solution I employed makes for happy modelling. - Historical and modelling. Workings include Yorkshire area. - Gresley 51'1 1/2" steel-panelled BT, LNER, ER. - Largely scratch-built fitting modified Kemilway sides to a Cu-clad base and modified MJT ad ABS parts. - 10th in the series. - Historical and modelling. LNER, former NER, ER. - Non-gangwayed, semi-corridor lavatory 3rd, both types described, detail changes and workings including M&GN. - D&S kit of the matchboard version, built for the early BR period. - Historical overview of types and formations, LNER and ER on former NER, GCR, GER, NBR regions. - Historical and modelling: formations and "standard" types. - LNER Gresley 61'6" FK, CK, TK. - Based on Kirk kits souped-up on semi-scratch underframes with MJT parts. The "Superfirst" FK needed replacement toplights with Stones window vents. - Overview of designs and gradual progression of formations used in: Marylebone Outer Suburban and Secondary service; King's Cross Inner Suburban; Dunstable branch. There were clear lines of development in these services over the years which I have tried to lay out clearly. - As above but looking at: King's Cross Secondary and Outer Suburban service; GN Section Secondary; the 1970s; Excursions. Conclusion of the half dozen or so different kinds of service on which the stock was deployed in a characteristic and methodical manner. - GNR 45' BT, BV with historical and service notes, LNER/BR. - D&S kits, main modification concerns chassis/body width. - Shows Ex-GCR, NER and GWR workings. - Historical outline and focus on an example: Cleethropes-Leeds. - Colour pictures include haulage by D1832. - Historical: a West Riding relief express made up with stock from a secondary service. An account of the Ordinary Passenger services, with some focus on the GC Section. Focussing on the catering combinations. Other aspects, from general formations to through coaches. One table was badly set and republished on p.332 in issue 4/6. - 51'1 1/2" 1st, LNER, ER. - Based on the Kirk kit before MJT did the etched turnbuckle trussing. Good detail of how to make up the ends. - Kirk kit with scratch-built trussing and lower steps. - There are some useful tips and illustrations here, but much was out of the box. Also, these vehicles were not lined. A set I built later in BR crimson had all-MJT parts underneath, cutting and splicing the trussing etchings. Between the carriages I made adjustable brass connections so that the spacing can be adjusted to the sharpness of the curves on your layout. Alas, no write-up to show for it; I hope these notes help. Amusingly, I put the BR(E) model in the Scalefour competition one year, and so did somebody else. What a glorious sight they were! 4pp, 14 illus. (including 2 sketches and 3 prototype photographs). - 52'6" GN.45D of 1912 with prototype notes. - D&S sides etchings married to a Cu-clad base, MJT ends, roof and general fittings. - Two different types of BT(6) with historical notes, an LNER/GC hybrid to D.59 (56') of 1924, and a more conventional 51'1 1/2" to D.246 of 1938. - Both built with reworked Kirk sides. The early one on GCR bogies got a scratch-built underframe, the later one MJT and ABS. Please note that the drawings provided by the Railway Modeller were produced without my knowledge and contain 35 mistakes. It was particularly poor to place a bad drawing next to the model pictures and make it look like I couldn't produce an accurate model! Was the term "silly billies" in vogue at the time? I submitted a correction with prototype photographs: it was never run. I have always believed in correcting historical errors at the first opportunity, as do most Editors. The Modeller preferred to turn a blind eye and let modellers be misled. So, ignore the drawings and work off the model photos which are nice and large. 4pp, 7 illus. March 1998.